Acquisition of an Agilent Technologies 7900 Series ICP-MS represents the second fully qualified ICP-MS on site. Whitehouse Laboratories is pleased to announce the acquisition of an Agilent Technologies 7900 Series ICP-MS, representing the second fully qualified ICP-MS on site. 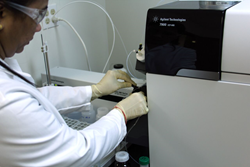 Whitehouse Laboratories first acquired ICP-MS capabilities with the purchase of an Agilent Technologies 7900 Series in December of 2014. The addition of this technology to our test fleet was necessary to fulfill client needs for elemental analysis of pharmaceutical articles, with demand stemming from the release of USP General Chapters 232 Elemental Impurities – Limits, and 233 Elemental Impurities – Procedures. Although USP General Chapters 232 and 233 do not fully replace USP 231 Heavy Metals until January, 2018, there has been steadily increasing demand to prepare and preemptively implement the more stringent and sensitive methodologies. Furthermore, the recent revision of USP 661, specifically 661.1 Plastic Materials of Construction, has introduced a substantial industry need for ICP-MS analysis of plastic materials used as part of pharmaceutical packaging components. Effective as of May 1, 2016, 661.1 has also increased demand for ICP-related services. Taking the demand from new regulations into account, Whitehouse Laboratories has acquired its second Agilent 7900 Series ICP-MS to increase both throughput in meeting current client needs as well as our potential for future growth and expertise in the area. The leader in testing, Whitehouse Labs, a division of Albany Molecular Research Inc., offers comprehensive analytical services providing support for manufacturing from development to market. From analytical chemistry and material qualification to packaging optimization, Whitehouse Laboratories is the testing partner for the world's leading Pharmaceutical, Biotechnology, Medical Device, Life Sciences and Consumer Products organizations.